Objects in Motion is a great photo opportunity to expand those clicking skills and let yourself shine through your photos. Lenzr is looking for images of objects in motion, think of things that go real fast. Perhaps it's the highway traffic that looks so beautiful far away. You might see a lot of bikes riding by that could be a thrill to capture. I found another awesome photo contest that is free. This is a fun challenge for photographers. You can capture that street car from an interesting angle in the night. 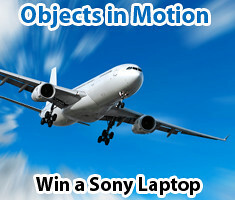 This Objects in Motion photo contest is a perfect chance to win a Sony laptop thanks to the support from a company that knows about motion and objects. They are a air freight company that has the capability to serve you at the highest level of objects in motion. Be sure to write something about your picture in motion to give a background to the viewers when you upload for free. The award winning photo will be announced September 1. Look at the Lenzr blog and read about past winners and judges. Thanks Toronto Arts Girl. I found this from your twitter. I just wanted to say I really appreciate you telling Toronto artists and art lovers, and all Canadians about the arts and opportunities for artists here in the city. Good work.